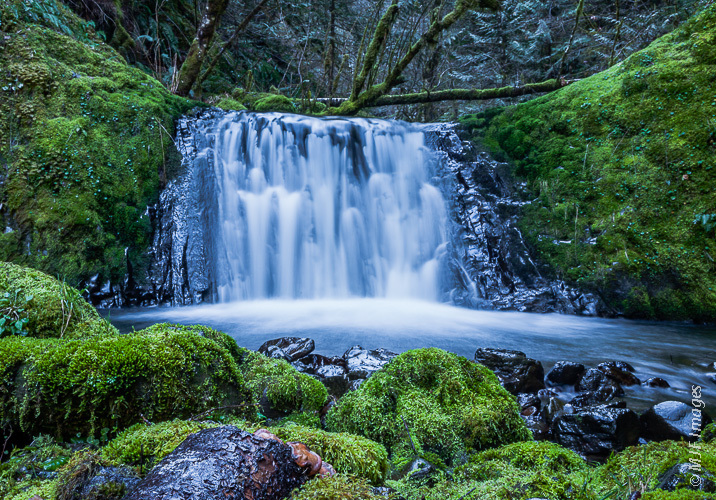 A small tributary of Eagle Creek in Oregon’s Columbia River Gorge drops over a small falls in a mossy glen. I have a hiking buddy who likes Google Earth. These words, for those who have similarly inclined hiking buddies, spell doom. It means the person, instead of trolling around on Facebook or Twitter like any self-respecting citizen might, spends computer time finding great hiking locations with no trails. They’re places that, though awesome, require bushwacking to access. Bushwacking, if you don’t know, is the exhausting, humbling, even sometimes humiliating act of pushing your way through undergrowth. It’s so much fun…not! 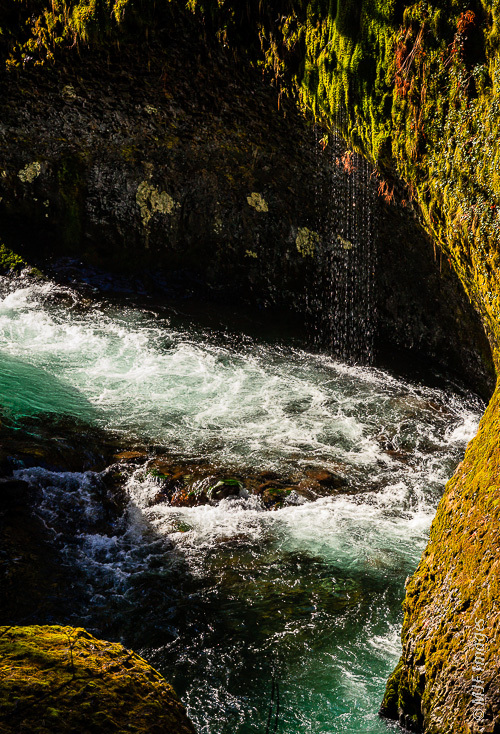 Eagle Creek flows through its gorge as Spring meltwater cascades from the surrounding lush Oregon forest. This past weekend myself and two other gullible suckers went along with Mr. Google Earth on a hike in Oregon’s Columbia River Gorge. I don’t know why this is, but he tends to zoom in on this area above others. I know it is partly because it’s close-by, and doesn’t involve a lot of driving (bushwacking takes time, after all). But I think he also likes the fact that such a struggle is involved to reach these places not many people (if any) will have visited. Call it an allergy to trails and well-traveled places. A bigleaf maple leaf from last autumn that had until recently been covered and preserved by rotting wood. Since I do have a similar bias toward relatively unexplored places, I am prone to going along on these “adventures”. There were about 10 people originally signed up for the hike, but 4 wisely backed out at the last minute, and another two showed up much too late to the meeting point for us to wait. We headed out with me driving. His truck he wore out on scouting missions and hikes. The hike started out with about four miles on a very popular trail, in fact the same one I blogged about last week, Eagle Creek. This stretch of trail hiking, you could tell, killed my friend. I think being on a trail is something that really drives him crazy. But we soon struck off into the thick brush and he was in his element. We crossed a mossy creek where each step was more slippery than solid ice would have been. Then we were faced with an insanely steep climb up an unstable slope made of thick moss covering loose boulders and rotten timber. How pleasant! But then we broke out on the open ridgeline, the one my friend had located using his beloved Google Earth. It was knife-edge in places, and the kind of scramble where short steep traverses alternate with a sort of tightrope dance along the top with only room enough to place your foot. Steep dropoffs on either side kept the focus squarely on the next step. But it was sunny up there! The day was glorious, and if you had spent the long winter in the Pacific Northwest you know that I mean truly glorious. Soon however, one of our team began to lose her nerve. I’ve seen this before. Somebody is along on the hike or climb who does not have the experience with exposure, and after an hour or so of being nervous they’ve had enough. So we had to turn back after not much more than a mile on the ridge. On an off-trail hike in Oregon’s Columbia River Gorge, we use a slippery log bridge to cross a rushing creek. We hope to go up again. Now that I know what is involved to access the ridge, and how open the top of it is, I want to complete the long loop trip that climbs to a place called Tanner Butte. I know there is a trail which returns to the Columbia from there, but my friend will probably locate an “alternative”. I think this will require a hand-picked team and a late Spring day when there is plenty of daylight. Scrambling up 4 1/2 Mile Ridge (unofficial name) in the Columbia River Gorge, Oregon. I had my camera along and took a few shots. Luckily we had a slower member and this allowed me to dawdle, setting up long-exposure shots of the beautiful tributary creek to Eagle Creek along with pictures of hiking & picnicking along the open ridge. Click on the images if you’re interested in perusing similar images or purchasing. They are not available for free download without permission, sorry. Thanks for reading. Spring is breaking, so get out there and hike! The Columbia River in the Pacific Northwest stretches westward as the sun sets. Looks like a fantastic hike and some amazing images. I really like “A small creek in Oregon’s Columbia River Gorge rolls through a mossy forest.” the saturation of the green and the milky white river flowing through. Thanks very much. Oregon is nothing if not green. I have never traveled to Oregon, Have been to Georgia, South Carolina and or course California. Maybe the next time i go I will have to add Oregon to my list of destination. Thanks a bunch. I shot the one with the log crossing at 2.5 sec., 24 mm, ISO 200. The other creek shot is 0.4 sec., 28 mm., ISO 50. Aperture for both is f/22. How well I know “Mr. Google Earth.” When my husband starts a sentence with “You know, we could…” I know I’m in for some serious bushwhacking “fun.” It works pretty well, as long as he’s prepared to bear the brunt of some serious cussing along the way!